Yet another epic day – completely different than yesterday, when we were pretty much done by lunch time. Today we got up as usual at 7am, I made my famous eggs and bacon, and by 9.30 we were gearing up at the car park. 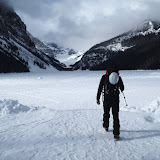 Lake Louise is based around 1h drive from Canmore. The approach is super easy – essentially walk the trail by the lake – you can almost see the fall from the moment you leave the car park. In short – it’s an amazing WI4/5 (depending on conditions) multipitch – up to 120m – that can be done in anything between 2 and 4 pitches. Biggest risk involve falling debris – which one party ahead of us seen first hand. 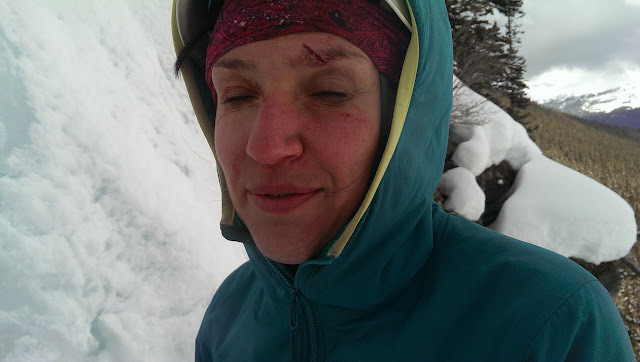 Big chunk of falling ice cut Kasia’s (that we met climbing with her boyfriend) eyebrow pretty deep. Luckily I had a first aid kit and could fix her up before she continued her adventure on the last pitch. But to get there one has to climb 3 pitches of fantastic ice up to amazing ice cave. Big shout-out to Del for leading the cave pitch (pitch 3) – absolute amazingballs! I must say though that for me, personally the most physically challenging was overhanging ice of pitch 2 leading to the cave – especially the top part of it – lead by Paddy: good job on that. 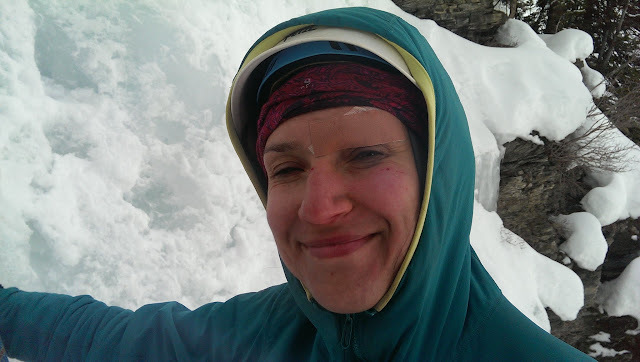 I should have really lead the 4th pitch – easy WI3 – but by the time I finished fixing up Kasia, it was already claimed. My bad really. I still enjoyed the day – probably the best so far. Us at the bottom leaving the climb. We took the right hand side line – with the cave seen 3 quarters up the route.